Loving tis gob. 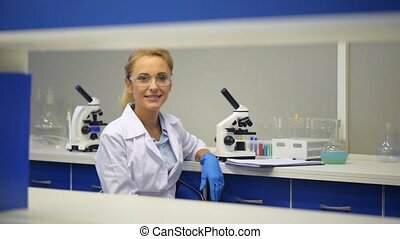 Joyful mature lady wearing a labcoat looking into the camera with a cheerful smile on her face after looking at a specimen under a microscope in a lab. Relaxed working environment. 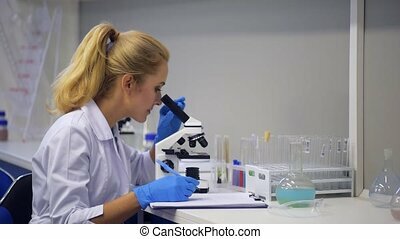 Female researcher looking into the camera with a slight smile on his face after using a microscope and examining a sample in a laboratory. We have done it. Amazed scientists getting excited while working together and looking on a sample with the help of a microscope in a laboratory. Positive attitude to work. Relaxed female researcher wearing a white coat and safety glasses smiling while sitting at a table and posing for the camera in a laboratory. Loving my job. 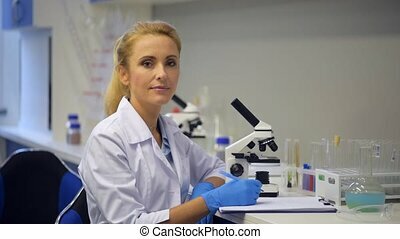 Waist up shot of a blonde lady looking into the camera with a slight smile on her face while sitting at a table and writing down results of an experiment in a modern lab. Friendly relations. 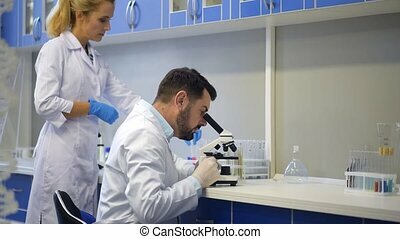 Male researcher looking through a microscope and taking a glass piece with a specimen foe detailed examination before talking with a female coworker and smiling in a lab.